Tomato sauces are not something I usually go for. Something about them just doesn’t do it for me. I think it’s probably because I totally over did it on spaghetti in college. It was an easy, cheap thing to make so I made it all the time because I could also get a few meals out of one batch. It’s a rare occasion that I want anything tomato sauce based, but I had a bunch of ingredients to use up this weekend and the best thing to pull together was this spicy tomato sauce. 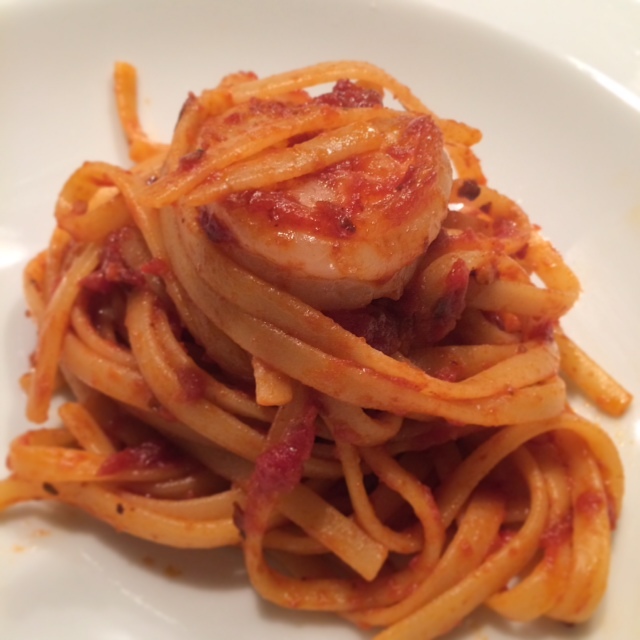 “Fra Diavolo” by the way, means “Brother Devil” – an appropriate name for this given the level of spice in this sauce. I know I say this about a lot of stuff, but this was SO freaking good. It was so yummy it even earned a spot on my short list of go-to pasta sauces. I just hope I don’t over-do it again like I did in college. Omit the seafood to be totally vegetarian friendly. Note, the seafood quantities are for one person. Adjust as desired for more servings. Heat ¼ cup olive oil in a large sauté pan. Add crushed red pepper, oregano, and garlic to pan; cook until lightly toasted, about 3 minutes. Add tomato paste; cook until lightly caramelized, about 2 minutes. Add cognac; cook until almost evaporated, about 2 minutes. Add stock, tomatoes, and bay leaf; boil. Reduce heat to medium-low; cook, partially covered, until thickened, about 30 minutes. While pasta is cooking, heat grapeseed oil in a pan. 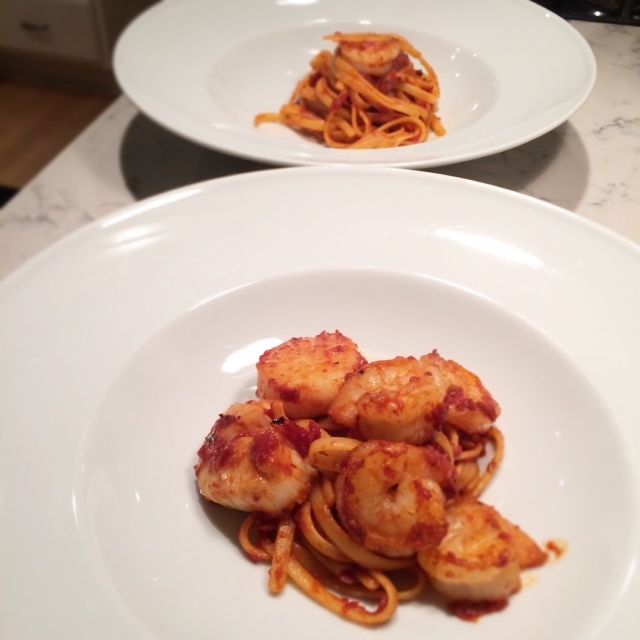 When oil is hot, sear the scallops, cooking about 2 minutes on one side, then turning and cooking for another minute. Heat a pan with olive oil and cook the shrimp until pink, about 5-7 minutes. Season sauce with salt and pepper and add shrimp and scallops. Add pasta; toss with sauce until everything is mixed and warmed through. Plate and garnish with the chopped parsley.